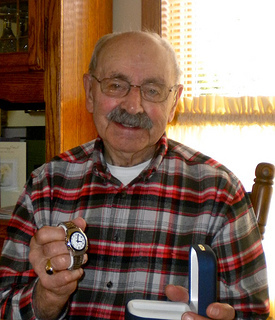 Low Vision Watches - Talking or Large Number Watches to Tell Time. There are so many great looking low vision watches that come with special features like alarms or nightlights, that telling time doesn't need to be one of your frustrations. If your glasses aren't handy or the light is low, by simply pressing a button the time of day is spoken in a clear voice. A talking wrist watch is designed to help those with low vision such as macular degeneration know the time and look stylish while doing so. It can also can be helpful when there's no light around or if your glasses aren't handy. A calm and audible voice clearly states what time it is when prompted by the touch of a button. 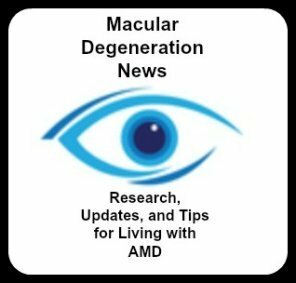 Determine which vision aid for macular degeneration you prefer - a watch that talks and tells you the time or one with large bold numbers contrasting on a bright white background or both. Before you make that special purchase let me tell you what some of your options are. First decide what style you want. √ Pendant watch which is worn around the neck. Once you decide on what style you like, think about what features might be most helpful. Don't speak English? Talking watches also come in a variety of languages. On a recent trip to the country that's known for it's timeliness, we found that the official Swiss Rail clock by Mondaine was chosen for it's simplicity and readability. 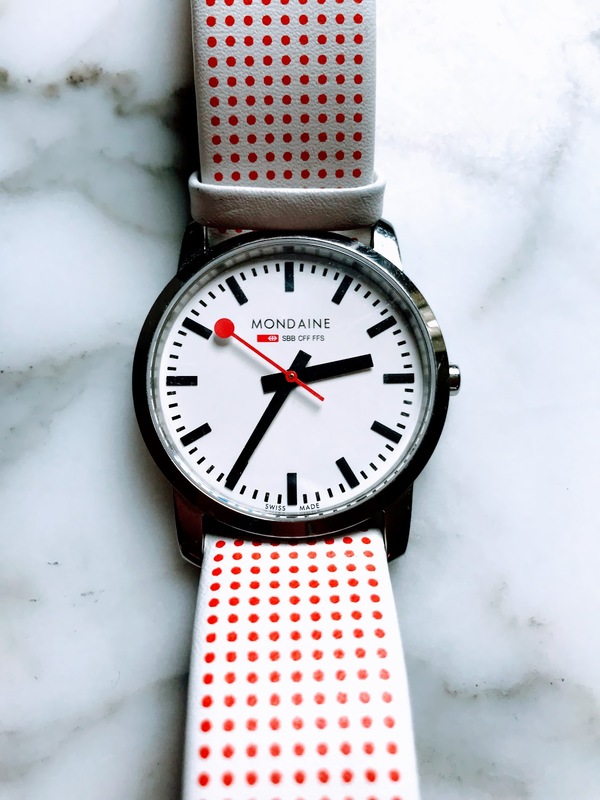 The white background with dark black markings provides needed contrast, while the famous red seconds hand is what makes it Mondaine. 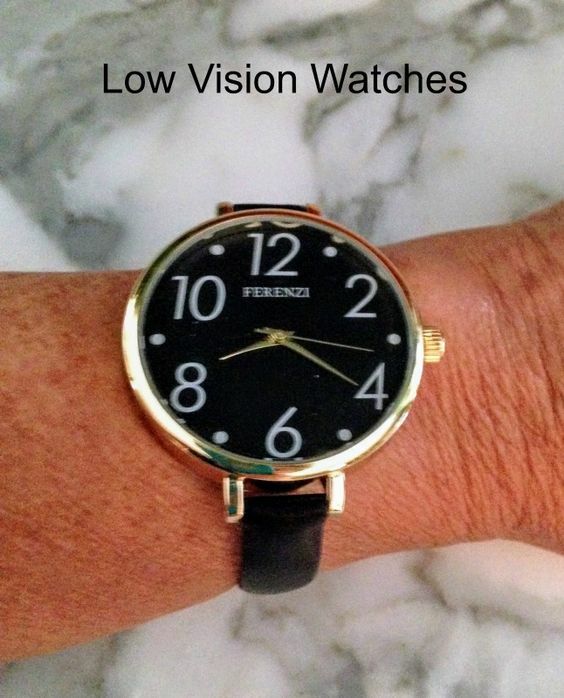 I keep looking for a lady's low vision watch (like the one we got my father-in-law) that has large numbers, talking feature, solar charged with atomic automatic time change but have not found one. 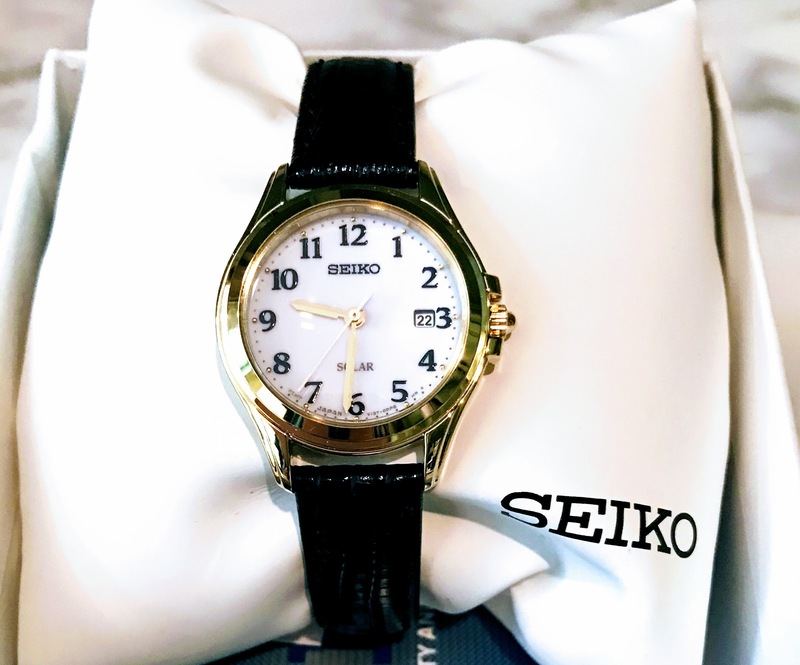 I settled for this Seiko solar powered watch and I for one will be happy not to replace watch batteries every year. A ladies talking watch provides the time and date by simply pressing a button. Even in dim lighting or when you're not wearing your glasses you can find out what time it is. If you are looking for a really pretty piece of jewelry that is also functional, this talking watch features both. This watch has a large face with bigger numbers. You don't have to give up pretty for function. This ladies watch has an expandable stretch band making it easy to slip on and off. Large, dark black numbers along with a female voice this low vision watch makes for a perfect gift for someone with macular degeneration. This women's inexpensive but dressy large number watch with contrasting white numbers on a black background makes it easier to see and tell time. The leather band fits even the smallest wrists. Some women prefer not to wear a watch, find that the watch does not fit their wrist, or want something more stylish. The talking watches have larger or wider wrist bands to accommodate a larger face and some women don't like that look. 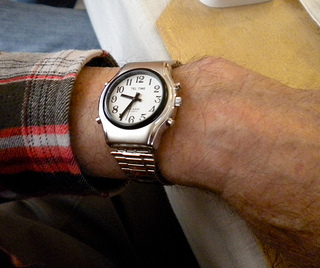 Many older ladies have small wrists and find that most wrist bands are too loose. 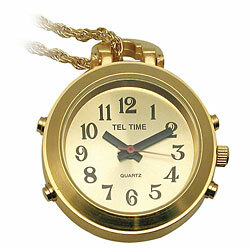 A stylish alternative to a talking wrist watch is a ladies talking watch pendant. It's easy to put on and easy to take off and there is no concern as to whether it will fit. The attractive necklace can be worn with any outfit. Every hour you will get a time announcement. If you like the added feature of an alarm, this watch has that too. 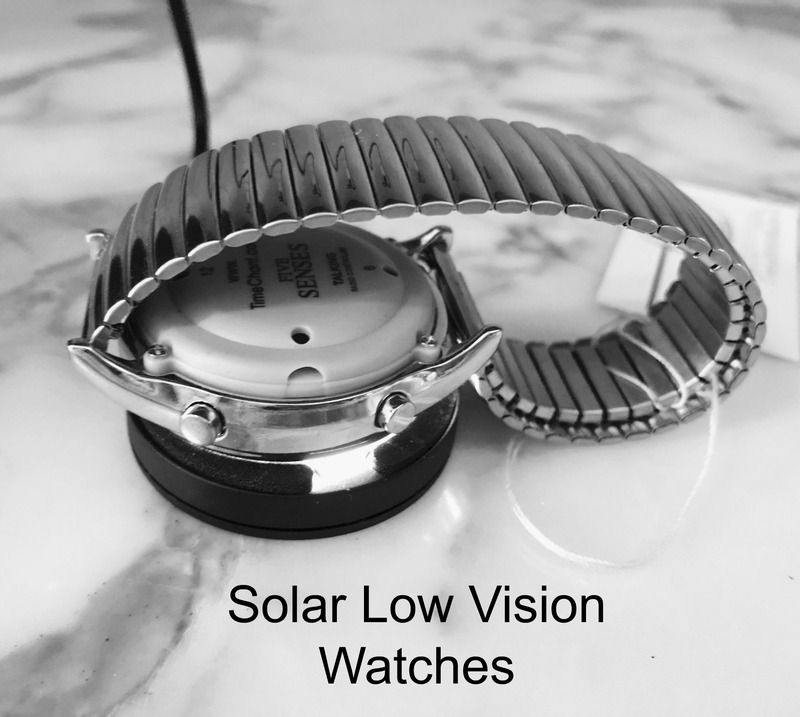 Low vision watches reduce or minimize the frustration of not being able to read your old watch anymore. Solar powered, atomic setting, talking voice and bold, black numbers were why we picked this watch for my father-in-law who has wet macular degeneration. 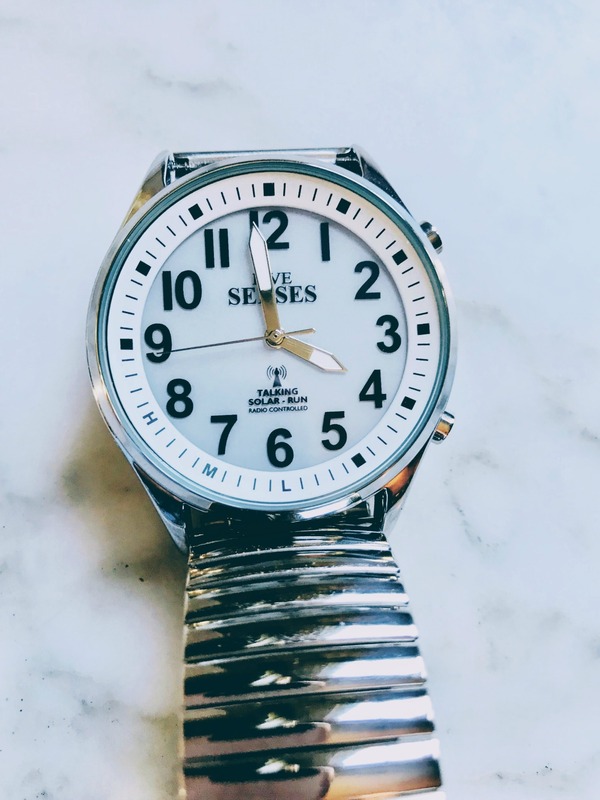 It automatically sets the time when daylight savings starts and ends and there is no need to go to a local jewelers to have the watch battery replaced. A radio signal from the US atomic clock in Ft. Collins, Colorado is received by the atomic watch which automatically sets the time and date adjusting when Daylight Savings starts and ends. Not only does this watch tell you the time, it also will announce the date, day, month and year. The atomic signal is not able to reach Alaska, Hawaii or Canada. Solar charging can be automatic when you are outside in the sunlight or you can use the USB Solar LED charging lamp. A large face with big numbers make this men's talking watch easy to see and hear. Everyone's vision is different - some prefer stark white numbers on a bold black face others a white face and black numbers. This one chimes on the hour for an easy reminder of what time it is. Also by simply pressing a button a clear male voice will give you the time. If you want an alarm to go off to remind me to take your pills or to get ready for an appointment, there are three alarm sounds. Make it simple again to tell time and to set the time with bold numbers, a voice feature, solar powered and atomic time setting.